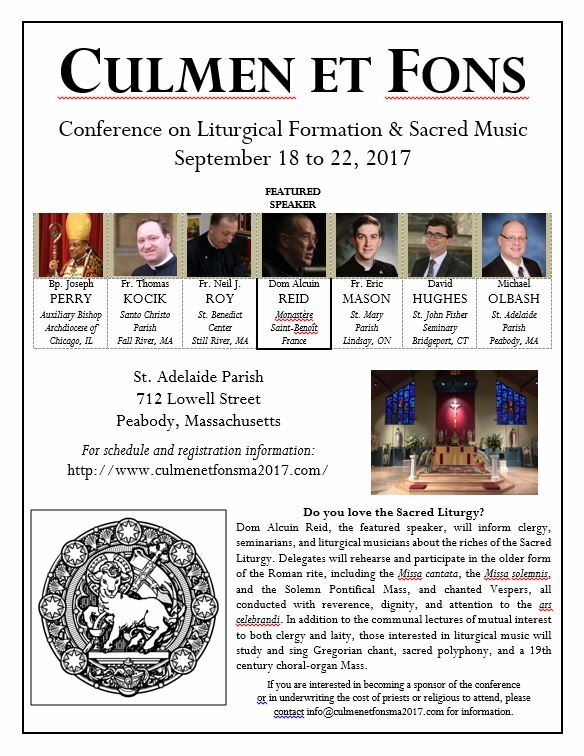 New Liturgical Movement: Culmen et Fons Conference, Sept. 18-22, Peabody, Mass. Culmen et Fons Conference, Sept. 18-22, Peabody, Mass. Saint Adelaide Parish in Peabody, Massachusetts (Archdiocese of Boston) will host a conference on liturgical formation and sacred music, with Dom Alcuin Reid as the featured speaker. For schedule and registration information, click HERE. Those interested in sponsoring the conference or underwriting the cost of priests or religious to attend should e-mail HERE.